PRODUCT : DALER ROWNEY ARTISTS WATERCOLOUR - 24 HALF PAN - METAL BOX. 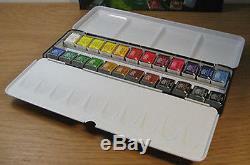 DESCRIPTION : This Daler Rowney set contains twenty four half pans of ARTISTS QUALITY Watercolour. This range is regarded by many watercolourists around the world to be the finest available. The box is of metal construction and holds 24 half pans. It features two areas for colour mixing, a thumb ring on the underside and has space to accomodate brushes. The colours included are as follows. Lemon Yellow, Cadmium Yellow Pale, Cadmium Yellow, Cadmium Yellow Deep, Cadmium Red, Quinacridone Red, Alizarin Crimson, Permanent Rose, Permanent Mauve, Phthalo Blue (Red Shade), French Ultramarine, Cobalt Blue, Viridian, Hookers Green Dark, Hookers Green Light, Yellow Ochre, Raw Sienna, Burnt Sienna, Light Red, Raw Umber, Burnt Umber, Paynes Grey, Ivory Black, Chinese white. The item "Daler Rowney Professional Artists Quality Watercolour 24 Half Pan Tin Set" is in sale since Monday, December 29, 2008. This item is in the category "Crafts\Art Supplies\Painting Supplies\Paint\Watercolour Paint". The seller is "bargainartistshop" and is located in Stafford, Staffordshire.